Known for his realistic portrayals of French peasants, Millet produced this painting at the very end of his life. He based the scene on stories from his childhood that told of great flights of wild pigeons. When the birds settled in trees at night, the peasants blinded them with light from torches and then clubbed hundreds to death. This haunting and strange picture--brutishly literal yet terrifyingly generic--is the final painting by Jean-François Millet, a remarkable last testament by one of the most profound artists of the nineteenth century. He drew on his own boyhood experiences in depicting the subject of bird's-nesters, who would hunt great flocks of pigeons at night by blinding them with torchlight and then clubbing them to death. By the 1870s Millet's paintings of rural life were among the most famous in France. His subjects are nearly all drawn from the peasantry, done just as the countryside was being depopulated by immigration to the new industrial centers. 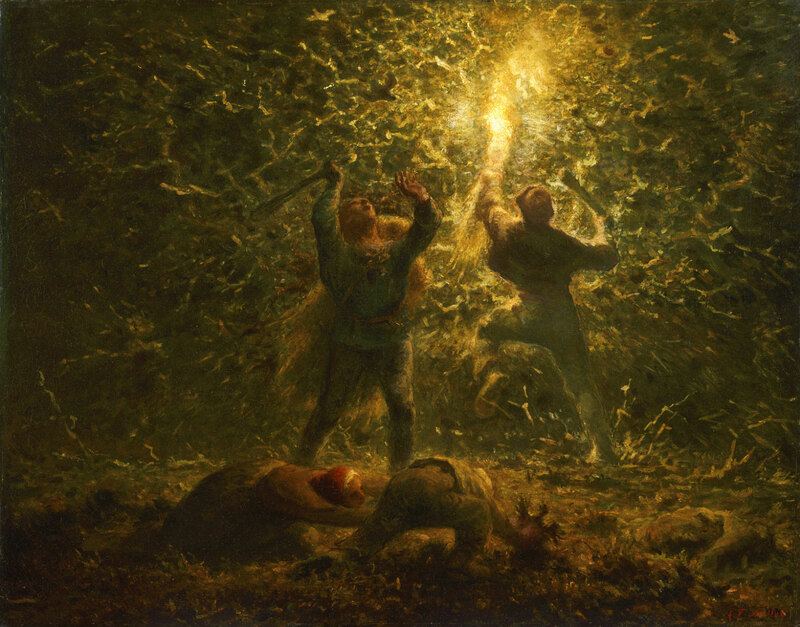 But unlike many other artists who worked in the very popular specialty of "peasant painting," Millet's great genius was his ability to bond his subjects to their native place while simultaneously elevating them to a level of universal humanity. Much of his success was based on his evocation of a communal memory of a lost rural world that was either arcadian or pathetic or a combination of both. Joseph J. Rishel, from Philadelphia Museum of Art: Handbook of the Collections (1995), p. 197.